Pneumadyne offers a full line air preparation equipment, from our advanced FRLs units to individual components, including filters, regulators, and lubricators. Our air preparation equipment will help you get the best performance from your pneumatic system. Request a quote today, or contact us for more information on our high performance air preparation equipment. Filter Regulator Lubricator units, commonly referred to as FRLs, are used throughout pneumatic systems to ensure that actuators, tools and work stations receive filtered, regulated and lubricated air. 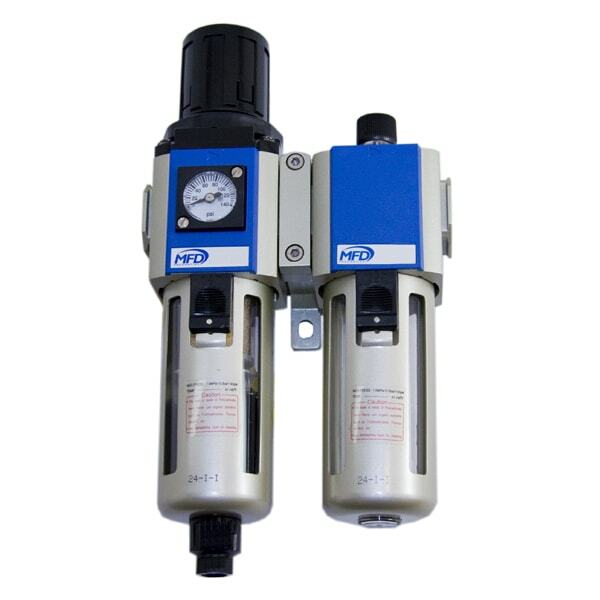 Available as separate components (see below) or as a single, complete unit, MFD Series FRLs can be relied upon to provide your pneumatic system and components with clean, compressed air for dependable operation. Pneumadyne’s MFD Series filters are ideal for removing contaminants from air systems, which protects system components from damage. Our MFD regulators ensure steady and reliable pressure. Space-saving designs make them easy to install and integrate into any pneumatic system. MFD Series lubricators add a fine oil mist to the air stream, which can help extend the working life of many pneumatic components. These combination filter/regulator units provide superior air pressure and flow regulation as well as 40 micron filtration to remove contaminants. Pneumadyne offers a range of accessories and optional components to give you even better performance from your FRL unit, including distribution blocks, gauges, and more. Request a quote on the air preparation equipment you need, or contact us to learn more.